San Giacomo Agro di Mosto... Agro di Mosto is a simple cooked grape must, acetified in French oak barrique (small barrels) & bottled young (approx. 18 months) to keep the fruity perfumes & delicate tartness. 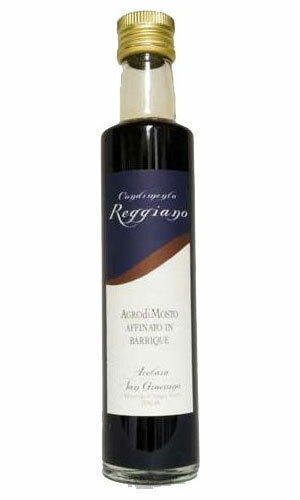 Agro di Mosto balsamic is ideal for sauces, vinaigrettes, & marinades. Drizzle Agro di Mosto on fresh green salads, steamed vegetables, or grilled meats & seafood. Inexpensive enough to use every day. Agro di Mosto balsamic...a staff favorite! San Giacomo Agro di Mosto Balsamic.